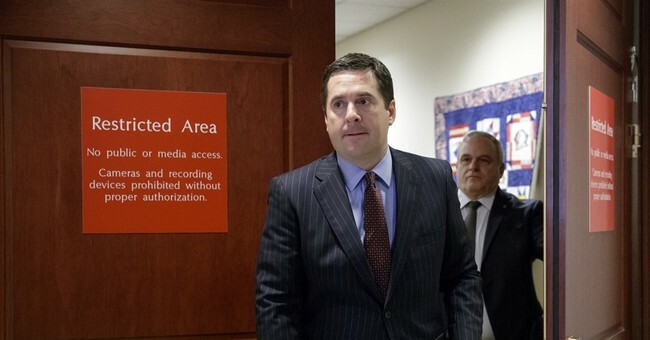 We now know what led up to Rep. Devin Nunes’ hastily-called press conference Wednesday in which he told reporters he had evidence that members of the Trump transition team had been incidentally surveilled. Nunes was traveling with a senior committee staffer in an Uber on Tuesday evening when he received a communication on his phone….After the message, Nunes left the car abruptly, leaving his own staffer in the dark about his whereabouts. Wednesday morning Nunes called the press conference, and even his senior staff members didn’t know what he was going to announce. Sources told The Daily Beast that is highly unusual for Nunes. After the press conference, he briefed the White House. The committee’s ranking Democrat, Rep. Adam Schiff, claims he’s “in the dark,” but sources told Fox News on Thursday that while he hadn’t seen the documents, he had been briefed on the contents. "I don't think he's shared it with anyone on the committee, and so we're all quite in the dark on this. "We I think suffered really two serious blows to the integrity of the investigation this week: one with that unilateral trip to the White House but the other with the cancellation of an open hearing that was scheduled for Tuesday." Nunes told reporters Friday that as far as he knows he’s the only one who has seen the documents. Nunes said the documents involved “legally collected foreign intelligence under FISA,” the Foreign Intelligence Surveillance Act, and they confirmed U.S. persons were incidentally collected during surveillance. This information would have been classified, by the very nature of its contents—and would have needed to be reviewed in a special location. The committee canceled an open hearing scheduled for March 28 and replaced it with a closed hearing with the heads of the NSA and FBI. Democrat members of the committee are still loudly complaining about Nunes’ actions, claiming it’s “obstruction” and “distraction” and demanding to know the source of the documents. Their public demands are irresponsible. National security is a serious – and sometimes deadly - business. If the person who shared these documents with Nunes has a fear for their life or other serious consequences, it’s logical that Nunes would be extremely careful with the information. Obviously there is a point at which members of the committee would need to see the full information Nunes was given, but until then a dose of discretion, patience, and faith in the rule of law is in order.